WASHINGTON — Looks like the former power brokers in the Chinese government may be several millions of dollars lighter, if a lawsuit gets its way in court. Reuters reported  that the family of murdered British citizen Neil Heywood is suing the Chinese, specifically Heywood’s killer Gu Kailai , for $8.2 million. 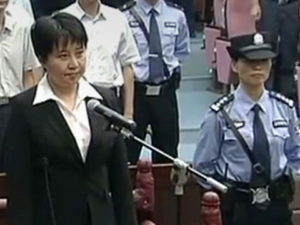 Gu is the wife of China’s former top leader Bo Xilai. She was imprisoned for a life term  last year for poisoning Heywood and that murder case led to a corruption trial against Bo Xilai. Bo had been a rising star in Chinese government circles until the trials were made public. In China, it is a custom for a murderer to pay compensation to the victim’s family. Heywood’s widow, Lulu, sued Gu for compensation for her and her two children, who are living in Beijing. Bo Xilai’s trial rocked the party and the country, as Bo is being brought up on charges of corruption, taking bribes and skirting the law. He also covered up Heywood’s murder, but those charges may not be included in the corruption trial.